Nodal Ninja panorama heads - standard models vs. RD16 - what's the difference? 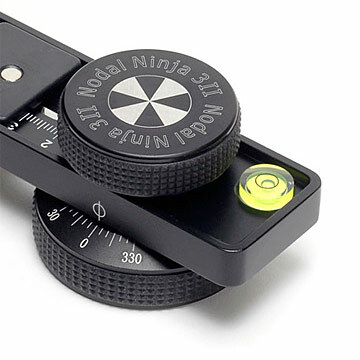 Nodal Ninja panorama heads such as the NN3, NN4, NN5 etc. are available from Red Door VR Ltd. in different versions such as the NN3 MK II or the NN3 RD-16 - what is the difference between the models? The models differ only in the rotator unit fitted to the head (other than they may of course ship in a larger case!). The remainder of the pano head is the same on both versions of the head, so the same horizontal and upper rails, top rotator, camera plate, rail stops etc. 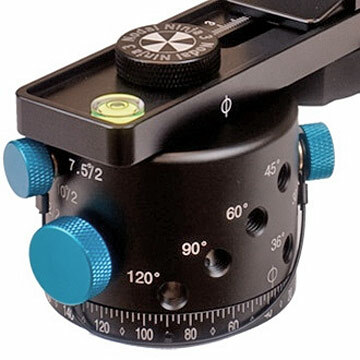 Standard Lower rotator design on NN3 MKII, enhancements include: new tension knob without inner lock screw, tension is easily adjusted by simply tightening the knob. Ball bearing detent plunger is incorporated in the MKII rotator for smooth rotation and click stops. New precision click ball replaces detent pin. This allows for a more positive feel and decreased wear. New precision CNC machined detent rings for better precision. Improved detent ring retention mechanism for easy change of detent ring. New rubberized metal knurled knobs. This not only allows for a better gripping but also creates a better feel and enhanced look. Reversible detent rings offer click stops at varying degrees are available. The Standard model NN3 MKII ships with TWO detent rings (reversible) with 'click stops' at 15º and 0º, the second ring has 45º and 60º, so allowing a wide range of settings such as 24 clicks per 360º rotation, 8 clicks, 6 clicks, and of course more variations by 'skipping' each alternate click, so using the 24 click stop setting and obtaining 12 clicks. Additional 'detent rings' are available, and swapping these out is as simple as unscrewing the top knob, unscrew the ring and flip over or replace with a difference ring. Nodal Ninja panorama heads with 'standard' rotators can be easily upgraded to the RD-16 Advanced rotator, simply remove the existing rotator and fit the upgrade with the fitting kit supplied. The RD 16 is a rotator that combines high precision, ease of use, compactness, light weight and durability - just what panoramic photographers have been waiting for. Suitable for lens ranging from ultra wide angle to 140mm (full frame). Some detent intervals (3, 5, 6, 18 degree) require the use of 2 detent knobs (supplied). No more need for skipping detent interval. Ideal for pressurized situations in which shooting must be completed quickly, such as in changing lighting. No more missing photos due to mistake in skipping. Made from imported premium quality aluminum alloy. Detent interval option can be changed on the fly. More than 10 kg (22lbs) loading supported. Small nadir footprint diameter of 62mm provides greater precision and stability. The unique placement of knobs means that they will never appear in the spherical panos. Fine 2.5 degree rotation markings for making high resolution mosaics.